A big church with a C12 tower and C13 arcades. The chancel and most aisle walls are C14 and the two-storey porch is C15. There are C17 and C18 iron tomb-slabs. Wadhurst was in the Deanery of South Malling (1 p90) and thus under the jurisdiction of the Archbishops of Canterbury. Originally a chapelry of Mayfield, a rectory existed by 1291 (Langdon p146), though it remained in some degree subordinate until the late C16 (1 p93). The tower and west wall are C12. Originally unbuttressed, the lower stage of the tower has round-headed north and south windows and each north and south bell-opening has two lights separated by a shaft with a weathered capital. Its north east quoins show the nave was then aisleless. Less obviously, the south east angle is of the same date, so the C12 nave was substantial. Differences of detail between the C13 arcades suggest the aisles were not added simultaneously. Both have four bays with alternating round and octagonal piers, which are not opposite each other. 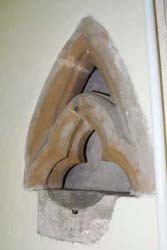 The north responds are semi-circular, the south east one is semi-octagonal and the south west one has a moulded corbel. The double chamfers of the heads are more pronounced to the north, which is thus a little later, and the arches are slightly higher. Godfrey (3 p6) suggests the heads were rebuilt in the C14, but it is hard to see why. In the south aisle, the main C13 remnant is the jamb of a triplet of lancets in the east wall, the dimensions of which suggest that there was a transept chapel (2 p178), like the later one off the north aisle. If so, the western part of the C13 aisle was probably narrower until it was widened in the C14 (see below). There is also part of a blocked C13 doorway in the surviving wall of the north aisle. 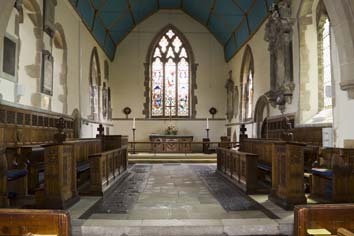 The chancel and the late C13 chapel off the north aisle show similarities, particularly the windows. The chapel has a two-light west one with cusped Y-tracery and a north one with a quatrefoil head, which, though renewed, is shown on the Sharpe Collection drawing (c1797). A half-arch across the north aisle at the entrance to the chapel springs from a pier of the arcade and resembles it. This shows that an aisle was intended if not already present, though no window dates from this period. The chancel has been extensively restored and probably heightened. Its south east window has cusped Y-tracery and though the north east window is incomplete, the Sharpe drawing shows a quatrefoil in the head, like the north chapel. They accord with the cusped intersecting tracery of the east window and two cusped north lancets (hidden outside by the C19 vestry). The sills of the windows inside are linked by a string-course and the rere-arches of the main windows are shafted. That of the south doorway forms part of the string-course and is semi-circular in form, as is sometimes found in the C14. The aisles were remodelled in the later C14, though the west window of the south aisle shows links to the rather earlier work in the chancel. The broad, gabled south aisle was probably widened to match the presumed south chapel. It has big traceried segmental three-light windows like Ticehurst, with ogee heads and reticulations; they have been reliably renewed. The lower ends of the reticulations are ogees, making them tear-shaped. There is a similar two-light window in the adjacent chancel, but as an old view of this side is lacking, it is not known if it follows a C14 original. The windows of the north aisle are similar, but though heightened at this time, it was not widened. Because of the higher walls, it has a low pitched, leaded roof, but the plain timbers inside are hard to date. 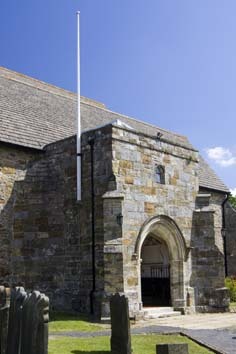 The C15 double-storeyed stone porch, here to the south, is like those in other churches in the area, though relatively small and lacking battlements (as at Ticehurst). There was a legacy for building a porch in 1402 (SRS 45 p272), so this may be the earliest in the area. 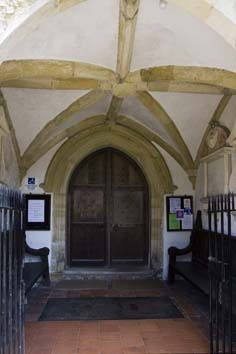 It is vaulted with transverse and ridge-ribs and has a small window for the upper chamber, approached by a wooden stair in the aisle. The east windows of the south aisle and north chapel are also C15, with panelled tracery (renewed at least to the south). 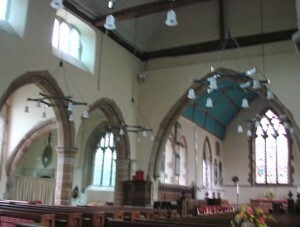 A new nave roof was built with queenposts braced four ways. The Sharpe drawing shows one small north clerestory window (there is no drawing of the south side) and the tower was altered without being heightened, with angle-buttresses, a slender broach spire, distinctly out of true, and a low tower arch. The west doorway appears to be of the same period and the date of 1812 with churchwardens’ initials must commemorate repairs. 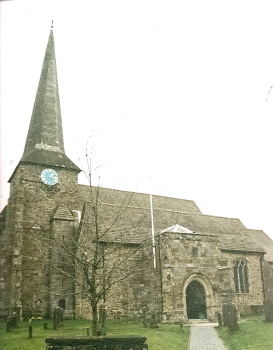 The church is said to have suffered four fires during the C16 and C17, in 1575, 1595, 1631 and 1680 (5 p367), but there is no sign of damage and the only identifiable work of the period is the south aisle roof, dated 1592 on the corbels. Galleries were inserted, but the Sharpe drawing does not show any other changes, though a west window of cusped Y-tracery and a doorway, dated 1812 were inserted in the tower and the altered west bell-opening may also date from then. The main restoration was by W Slater in 1858 (B 16 p729), but there may have been earlier work, for his report mentions a side-window installed some time before, though none is visible on Adelaide Tracy’s drawing of 1852 (IV p53), also of the north side. He removed the galleries and repaired the windows accurately, except possibly the west one of the north aisle. The clerestory, consisting of groups of three windows, may also be by him. Though both obviously C19, neither the chancel roof nor the chancel arch is mentioned in Slater’s report of 1858. They could date from a restoration in 1891 of which nothing certain is known (Langdon p146). There is also a report in 1872 of damage from lightning to tower and spire (B 30 p493), though there is no evidence of this. Finally, in 1911-12 a vestry was added in the angle between the chancel and the north chapel (4). Altar: (Chancel) Carving on front by F Rosier, 1932 (4). Font: A round C13 bowl with a heavily moulded top and tapering sides. The base looks C15, so it may have been assembled from separate pieces. 1. (East window) J Cameron, c1886 (www.stainedglassrecords.org retrieved 29/3/2013). It consists mostly of medallions set in patterned glass, of a kind that was very old fashioned by this date, despite the presence of some figures outside the medallions. 2. (South aisle west window) Morris and Co, posthumous design by Sir E Burne-Jones, 1900. 3. (North clerestory second window, centre light) A figure of St Gregory that was intended to be the first of a series by Chater and Son, 1903 (ibid) and shows the influence of Kempe, though the inscription is more prominent. 4. (North chapel, north window) J Hardman and Co, 1913 (Index). 5. (South aisle, east window) J Powell and Sons, designed by J H Hogan, 1916 (Hadley list). 1. 31 iron tomb-slabs, the largest group in Sussex, cover much of the nave and aisle floors. Too many to list, they range from 1617 to 1768 and illustrate the development of the type. Many are to members of the Barham family, who were ironmasters in the area (Mee p375). The early ones are limited to lettering, whilst the C18 ones have more elaborate inscriptions and heraldry. 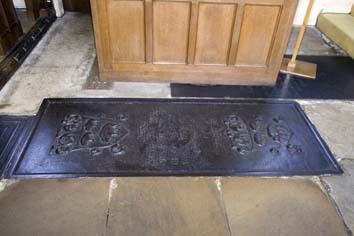 Uniquely, that of 1747 to Judith Legas (Nave centre aisle) has the date and the initials of the deceased, IL, in inset brass letters. 2. 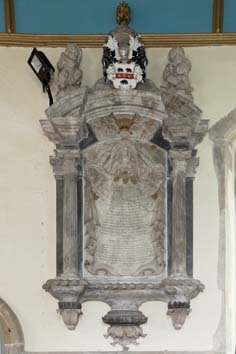 (North chancel) Mary Davison or Dunmoll (d1651) attributed to F Grigs (BE(E) p645). Advanced in style for the date, the monument is made of differently coloured marbles with a kneeling figure in low relief, all surrounded by heraldic emblems and arms. 3. (South chancel) John (d1723) and Lucy (d1716) Barham by W Palmer, said to date from 1730 (Roscoe p937). The cartouche of carefully arranged drapery is contained within Corinthian columns beneath a curved, broken pediment. It is of superior workmanship to any other monument here. 4. (South chancel) Burgis family (c1764) attributed to Sir H Cheere (BE(E) ibid). 5. (West end of nave) Judith Legas (d1747) attributed to Sir H Cheere (ibid p646). She is also commemorated by the iron tomb-slab mentioned above. 6. (South porch) Richard (d1793), George (d1807) and John (d 1805) Luck, attributed to J Harmer (most recently by Llewellyn p357), though this has been questioned. 7. (South porch) Among the memorials to the Luck family is a tablet in memory of Mary Georgiana Luck (d1817) and commemorating other members of the family down to 1836. This is mostly plain and shows little distinction, but in the rounded top are two terra cotta ovals of flowers which are indubitably by J Harmer. Since he is known to have produced conventional monuments as well, it is likely that the whole tablet by him. 1. (South aisle) Large and pointed with a shelf, probably C14. 2. (North chapel) C14 with a double head, the inner of which is trefoil-headed. 3. (South chancel) Ogee-headed and early C14. 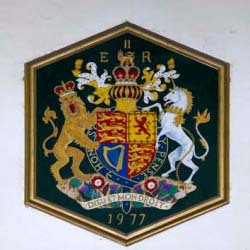 Royal Arms: (North aisle) Painted on a hexagon and dated 1977. Sedilia: (South east window of chancel) The lowered sill has three stepped seats. It is no doubt later C13 like the chancel itself. 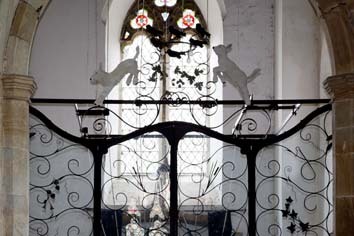 Screen: (In tower arch) Ironwork, ornamented with emblems relating to local agriculture and natural history by J D Wylson, 1957 (4). 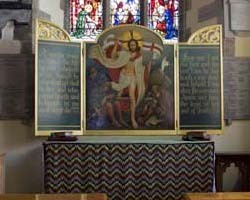 Triptych: (East end of south aisle) Resurrection in the centre panel with texts in the side ones, painted by L Lee to a design by M Travers, 1946-47 (Warrener and Yelton p322).